As radio equipment builders and operators, we still battle two fundamental issues that have been around since the beginning of time (well, from Marconi's time, anyway) - grounding and power supply fluxuations. 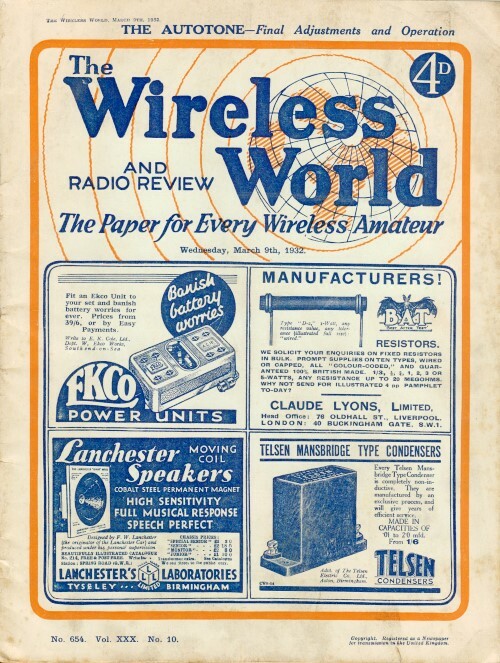 Both topics are addressed briefly here in this editorial column from a 1932 The Wireless World magazine. Back in the day, grounding was referred to as "earthing," and was/is essential to optimal wireless and wired performance. Line voltage fluxuations are generally much less severe today than in the 1930s thanks to better transformers, automated monitoring and adjusting of line voltages, and better distribution designs. The worst type of power line fluxuation - a lightning-induced surge - has been greatly reduced thanks to superior engineering, primarily by the simple running of a grounded neutral "static" wire running at the top of all the lines below it on utility poles and transmission towers. The water pipe has been the wireless user's best friend for many a long year, and, despite many attempts to persuade the public to adopt the ideal of efficiency in the shape of a specially constructed earth buried in the garden, the vast majority of listeners still adhere to the original expedient of making the earth connection to the water pipe. No book of instructions on the installation of a set has been complete without the advice that, if a buried earth is impracticable, then a clean . connection to the water pipe should be as a very satisfactory alternative. After all these years of quiet enjoyment of the facilities which the water pipe offers it will come as a shock to learn that an attempt is being made to divorce wireless sets from water pipes on the grounds that the practice "is likely, in course of time, to cause serious deterioration of the water pipes and mains, leading to subsequent leakage of water. The first instance of objection to come to our notice originates with the Portsmouth Water Company, and it seems likely that, if their view is accepted, other water-supply authorities will also take steps to prevent the use of their water pipes for wireless earthing purposes. It is difficult to estimate the inconvenience to wireless users which would be caused if they were deprived of this means of earthing, and we therefore feel that a scare in regard to the damage which might be caused to the water pipes ought not to be started unless there is ample and unchallengeable evidence that damage does actually result. Up to the present we cannot recollect having seen any evidence published of damage resulting from, this practice, and we would like to be referred to any reliable source of information on this subject or records .of experiments which have been carried out. Surely this subject must have been fully investigated long ago, and the reason that no action has been taken is that there is no justification for it. Whilst recognizing that if damage to water pipes does occur, then water-supply companies have every right to protect their property, yet we feel very strongly that when the use of the water pipe for this purpose has been so universally adopted over many years no restrictions ought to be imposed on frivolous or ill-founded evidence. It is interesting that, just after we have been discussing in our columns the question of fluctuation in the voltage at consumers' mains, a case should have been brought up at the Exmouth Petty Sessions, where a local Electric Light and Power Company has been fined for selling electricity at a voltage lower than that declared by the company and required by the regulations. It appears that many complaints were received in this case in regard to the variation in supply; the voltage at consumers' terminals should have been 220, subject to a possible variation not exceeding 4 per cent. above or below. Voltages as low as 196 were recorded by an inspector, and proceedings were taken against the supply company after a number of investigations had been made. In imposing the fine of £10, the Chairman of the Bench remarked that the actual liability of the company was some £95. It is to be hoped that the wide publicity which this case appears to have received may have the effect of reminding other supply authorities of their responsibilities, so that they take greater precautions to maintain voltages within the prescribed limits.